Does Rapidlash really work? Find out by reading our Rapidlash review, with before & after photos and application tips. Let me start with saying this: As I’ve mentioned in past CF articles, I’m obsessed with eyelashes – they’re really the first thing I noticed on people, and therefore, I’m obsessed with making mine as long and pretty as possible. Due to this obsession, I can’t leave a drugstore without buying a mascara (or five). So it’s only natural that I’d expand my experimentation into the world of eyelash treatments. Over the past year or so, after the invention of prescription Latisse, cosmetics companies everywhere have jumped on the eyelash treatment bandwagon, creating products designed to give you the eyelashes of your dreams with just a few daily applications. My first foray into the eyelash treatment world was with L’Oreal’s Lash Boosting Serum ($20 on Walgreens), which I raved about here. You can guess what happened next – three minutes later, it was purchased and on its way to my house, and I finally fell asleep, dreaming of a mascara-less future. Wanna know how Rapidlash worked for me? 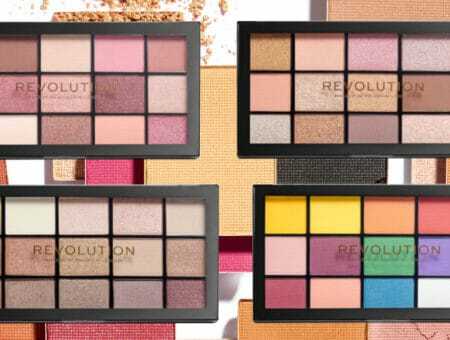 Read on to see my review! 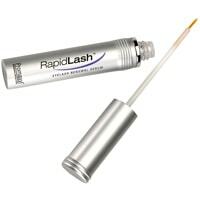 Rapidlash is an eyelash-enhancing serum. It comes in a mascara-like tube that has liquid liner-type brush at the end of it. After four-six weeks of daily application to the lashline, the product promises longer, darker, curlier lashes. 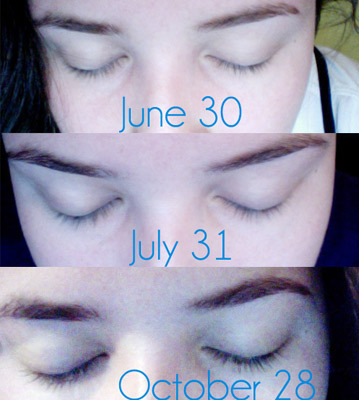 I started using Rapidlash right after using L’Oreal’s Lash-Boosting Serum – so the “Day 1” picture above is after three and a half months of using L’Oreal’s product.I was pretty diligent about applying Rapidlash every night on my lash line – I didn’t put any on my eyebrows, which is another way the product can be used. Although I was a little worried about potential side effects, I did not experience any sort of discoloring, tingling or stinging when I used this. Sometimes, when it accidentally got in my eye, my eyes watered, but no more than they would have from eyeliner or mascara. The application is basically just like putting liquid eyeliner on – it’s simple and straightforward and only takes a minute. Because I’d been using a lash conditioner beforehand (which I stopped using in order to properly review this product), my lashes definitely felt sparser during the first few weeks of using Rapidlash. 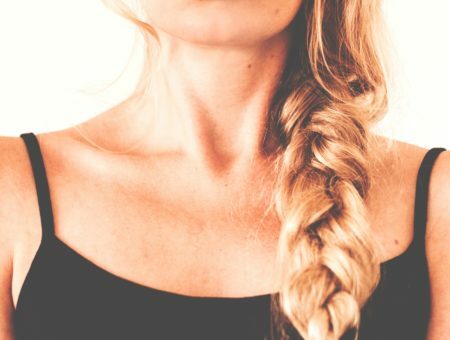 To be honest, I didn’t see any results until six weeks in – the lashes that grew in then were definitely longer and it seemed like there were more of them along my lash line. However, the lashes that grew in were thin and brittle. After a full lash cycle, I definitely had a denser lash line with longer lashes, but I did not see a difference in lash darkness, lash thickness or lash curliness. After the full 13 weeks, I began using Rapidlash in conjunction with the L’Oreal Serum. The final picture above was taken after four months of daily Rapidlash application and probably six weeks of Lash Serum application – I’m not wearing any makeup in the picture, yet my lashes look longer, darker and fuller than they used to with mascara! Again, at this point I was also using L’Oreal’s Lash Boosting Serum on my eyelashes twice a day, so my results might not be typical of just Rapidlash usage. If I had to give my lashes a grade on their own, without any kind of serum, I’d give them a 30%. After using just Rapidlash, I’d give them a 50%, but with Rapidlash and L’Oreal’s Lash Boosting Serum I’d give them a 75%. Bottom line? I saw a definite improvement in the quality of my lashes after months of using Rapidlash, but it’s not like anyone is going to come up to me and ask me if I have fake eyelashes on. The pictures speak for themselves, but that said, I’m probably not going to repurchase Rapidlash again. Why? It’s expensive (it retails now for $50), and for the price, I want better results. If you’ve never used any kind of eyelash serum and you want to try something, I’d recommend L’Oreal’s Lash Boosting Serum (I swear, they aren’t paying me to write that!) over this product, but I would not say RapidLash is a total waste – if you find it on sale or you’re given it as a gift, definitely give it a go! For now, I’m still looking for a serum that’ll give me Kim Kardashian lashes- hey, a girl can dream, right? 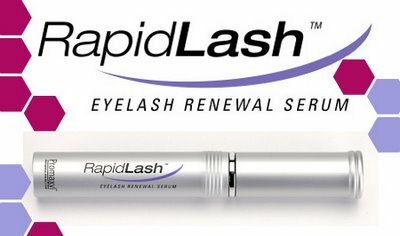 Have you used Rapidlash? What did you think of it? Are you going to try it? What other eyelash serums have you tried or do you want to try? Tell me everything in the comments!